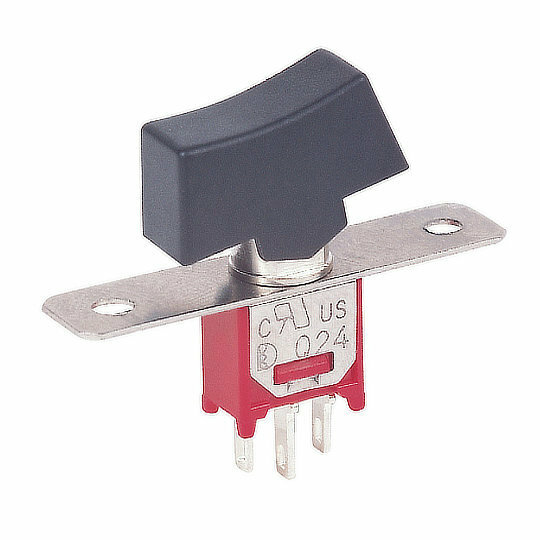 The 4M series of sub-miniature rocker switches from Dailywell are single or double pole switches with double throw operation and maintained or momentary action. The 4M series offers a choice of termination styles including solder lugs, PC thru-hole and right-angle terminals in silver, gold over silver or gold. The electrical ratings for terminals in silver/gold over silver are 3A at 120VAC/28VDC or 1A at 250VAC and gold 0.4VA at 20VAC/DC. The 4M series of sub-miniature rocker switches from Dailywell are single or double pole switches with double throw operation and maintained or momentary action. The 4M series offers a choice of termination styles including solder lugs, PC thru-hole and right-angle terminals in silver, gold over silver or gold. The electrical ratings for terminals in silver/gold over silver are 3A at 120VAC/28VDC or 1A at 250VAC and gold 0.4VA at 20VAC/DC. Available in multiple actuator styles including rockers and paddles with a choice of 9 actuator colours and various legends. The 4M series perfect for applications such as Instrumentation, Test Equipment, Telecommunications, Networking and Audio/Video Mixing Boards.